May 8, 2017 May 8, 2017 Laura4 Comments on Fade. 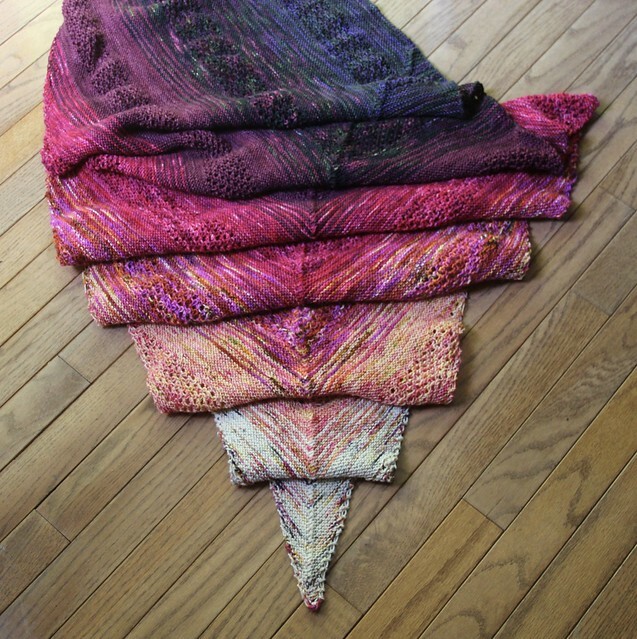 Late last year the knitting community was swept up in the craze of the Find Your Fade shawl by Andrea Mowry. 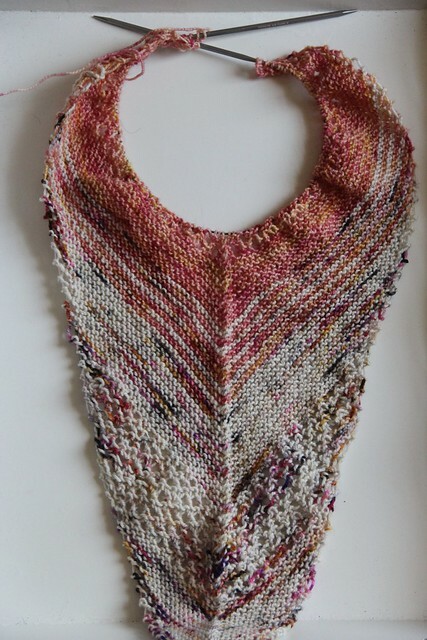 I’m not exactly sure what makes the shawl so appealing: the amazingly fun use of yarns in a gradient, the unusual shape, the interplay of garter stitch and a simple lace pattern. 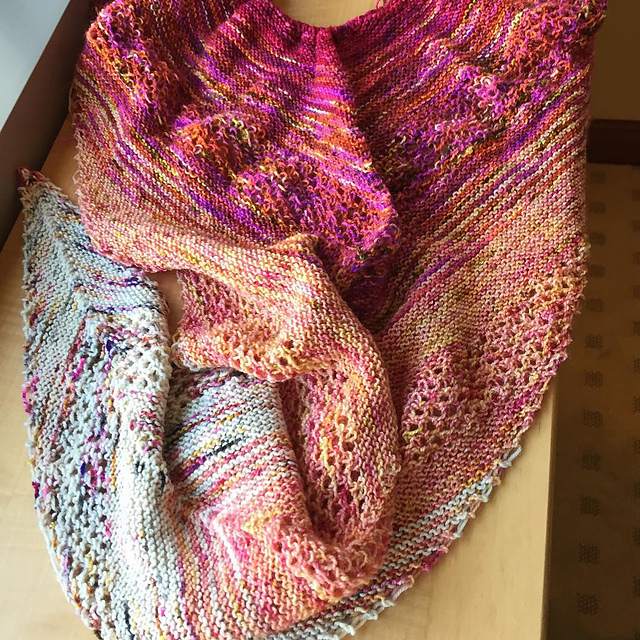 All I know is I watched so many people knit it and when I couldn’t wait any longer, I went ahead and dumped all my yarn out to find my own fade. 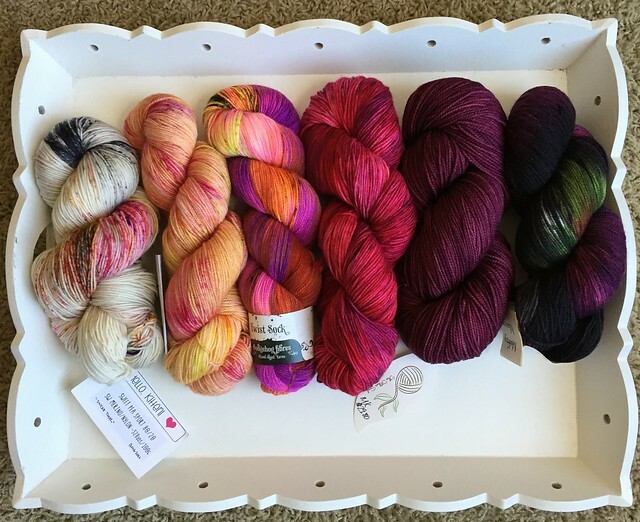 I ended up choosing (left to right): Lamby Toes Sweet Pea Sport in Sweet Tooth, Suzy Parker Yarns BFL in Tangerine Twist, Hedgehog Fibers Twist Sock in All That, Knitcircus overdyed by me, The Fiber Seed Sprout in Merlot, and Supernatural Yarns Nymph in Malfoy Manor. The first bits went by so quickly! Then the rows got longer and longer, and I didn’t pay attention the pattern as well as I should have. Mine ended up a bit longer and wider than the pattern calls for and I ran out of yarn. 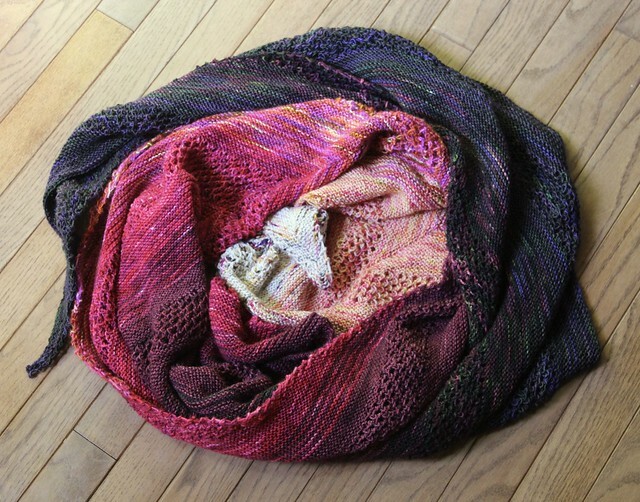 Luckily, I was able to order a skein of Blue Moon Fiber Arts Socks that Rock in Korppi to finish off my shawl. 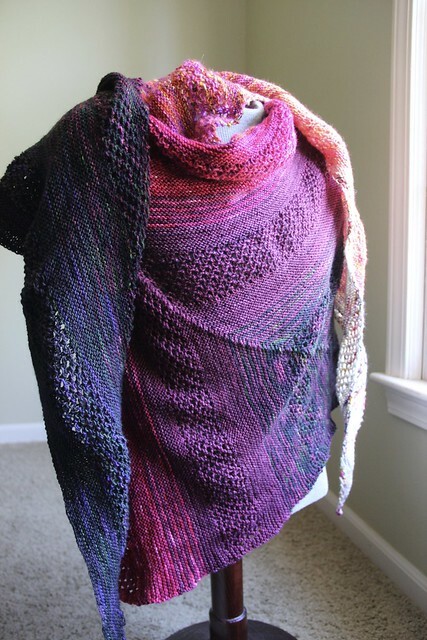 This shawl is amazing. First of all, it is enormous and will definitely keep me warm on a chilly day. I also love all the ways I could wear it – light to dark, dark to light. 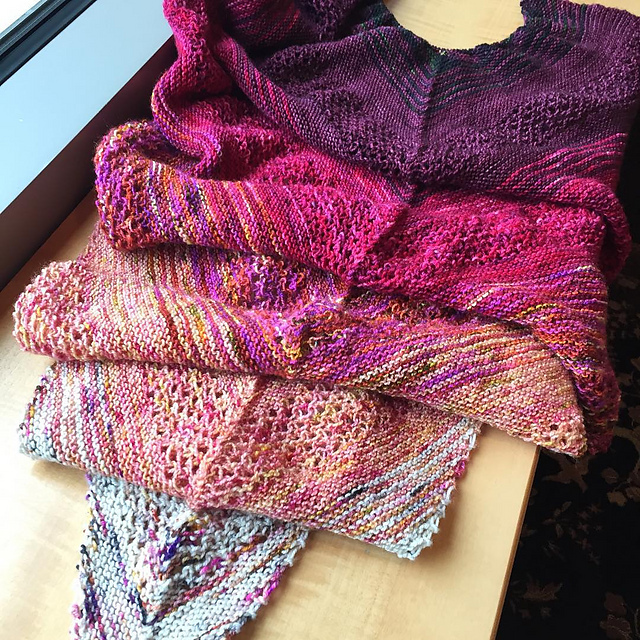 It was a fun knit and I’m already eyeing my stash to see what else I could knit in a similar gradient pattern. That’s a great color selection! I love all the different versions of the Fade. I’m already planning on knitting her So Faded sweater. Ooo I bet that will be gorgeous! Can’t wait to see. 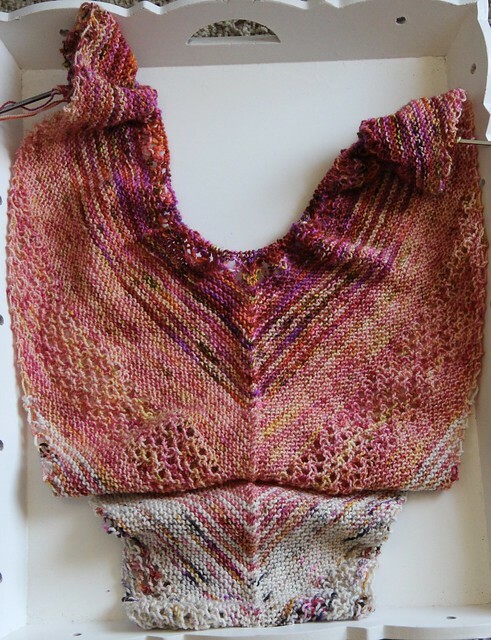 Previous The Corner of Knit & Tea: Episode 136, Finished my Fade.